This necklace is made from a vintage gold-plated signed Coro 4 picture locket. This locket is one of the most amazing vintage lockets I have seen and is relatively rare as I haven't come across another one of these in over 6 years. It has a square shape with an etched design on the front and a plain back. It has a strong clasp. The locket opens to hold four photos, three of the photos have metals frames and plastic lenses and the other photos is taped on. All of the photos can easily be removed and replaced with your treasures. The locket is hanging on a 14/20 gold-filled chain along with a gold-filled spring ring closure. As this piece is vintage, it does show minor signs of wear. This chain measures approximately 17 inches and has a 14/20 gold-filled spring ring closure. The locket hangs approximately 1.5 inches from the chain. 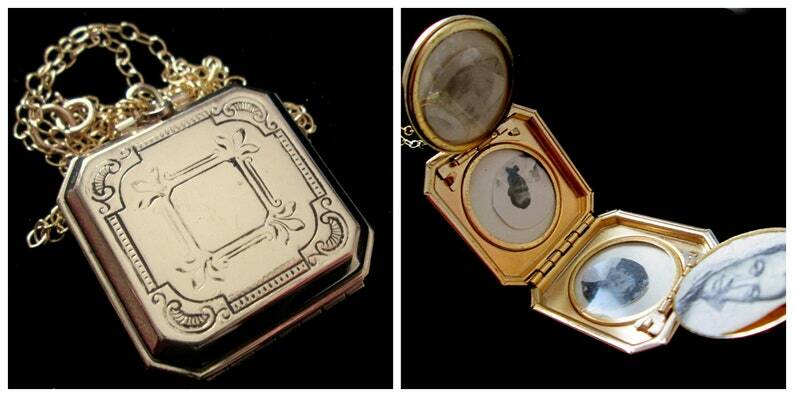 The dimensions of the locket are approximately 32 mm x 32 mm. The picture circles are approximately 22 mm in diameter.